#3763, "Fixing Lowrance / Minn Kota Interference"
So I got that Minn Kota Fortrex 101, wired it up and went to the lake - only to find terrible interference on my bow graph. Every time I hit the trolling motor, the screen went black. Bow graph is a Lowrance LCX-28HDc. I read around online and waded through a lot of random posts about things to try. Through amazing good luck, the first thing that I tried actually worked. So here's what it was. Picture your 36v system is like one big battery. There's a positive connection from the switch up at the bow on the first battery and a negative connection on the third battery that goes back to the bow. 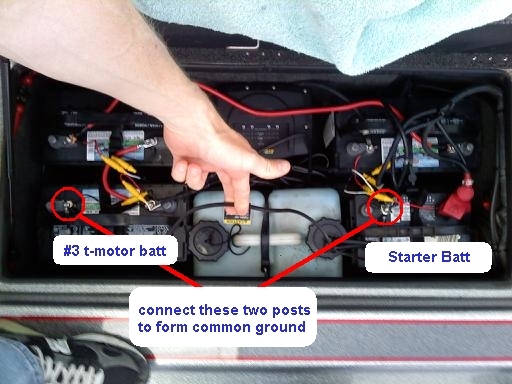 You take a piece of wire and run it from the negative connection on the third battery to to the negative connection on your starter battery where your fish finder is hooked up. This provides a common ground between the batteries. For me, this worked great and I no longer get any interference. For reference, I'm running the Fortrex 101 with no integrated transducer. Hope this helps someone. #3764, "RE: Fixing Lowrance / Minn Kota Interference"
#3769, "RE: Fixing Lowrance / Minn Kota Interference"
Thanks Rob, I'll try this. I fish small San Diego lakes mainly; lakes I've fished all my life. Haven't had a sonar unit for a few years. Buddy gave me a couple of his old ones and I've been having that same problem. I also have the Minn Kota 101 Fortrex. How sick is that T Motor though huh? LOL Love it! Will love it even more after I try this and my sonar unit works right. FIVE POUNDERS ARE SMALL !